The Green School Supplies and Back to School kit from Guided Products is available exclusively at ApplePieUSA and sells for only $14.99 which is have the full retail price! *1.5" ReBinder Select - Capacity 300 pages. 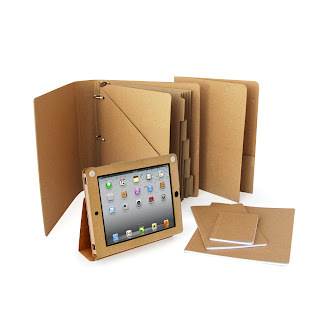 Made from super thick, 100pt chipboard and single piece construction, this D-ring binder is made to be thrashed. Draw on it, slam it in a locker, drop it. It will still protect your work and papers. It may looked roughed up after a bit, but will hold up great under stress. *Each binder comes with tab dividers and RePouch insert for key stuff to be highlighted. *RePocket recycled pocket presentation folder. Holds 20 pages on each side, and is perfect for class presentations or for keepings notes from class! *ReWrite recycled Journal 8x10 Graph: an 8"x10" Notebook with graph paper. Notebook has 48 pages (24 sheets). *ReWrite recycled Journal 5x8 Ruled: an 5"x8" Notebook with ruled paper. Notebook has 48 pages (24 sheets). *ReWrite recycled Journal 3.5x5.5 Blank: an 3.5"x5.5" Notebook with blank paper. Notebook has 48 pages (24 sheets). *iPad Case for Students: This innovative iPad case is designed to be personalized! Here's a video to check out! Includes one for the full size, but a shopper can choose the mini at checkout!! Can also choose for Kindle Fire, or Kindle Fire HD! So why are these so special??? All of these products meet the core requirements of being green: they're made from recycled material, Made in the USA, and 100% recyclable!! Let those little artists doodle, make a collage, use stickers or make a serious artistic rendering on the covers of these to personalize them for school. My kids are decorating my Kindle Fire HD case for a birthday present! How fun to have a personalized case to never mix up my Kindle. You know they doodle on their covers anyhow, why not give them a clean slate to be artistic. I love, love the idea of the recycled products to green our environment as well. Super quality, these are not flimsy at all! Love this - we need some organization! That is such a great item! I love these products! Thanks for the review. These are awesome products. Thank you!